In front of the entrance to the Vis Bay there are several small islets. 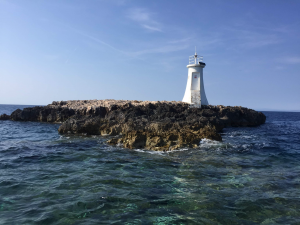 Among these there are Volić Veli and Krava – rised to more or less one meter rocks, on which are located lighthouses marking the waterway for the vessels entering the port of Vis. The names of these islets in English mean a bovine and a cow, and about the lighthouses it is said that these are horns of the animals. Krava delights divers with the beauty of nature. Offset from the island of Vis, despite a short distance from the town, results in existence of many various organisms of local flora and fauna in this site. Besides, at the depth of about 30 m, there are Roman amphorae – remains of the ship, that must have crashed in this place over two thousand years ago. Due to the length and depth of lying, the amphorae have been abundantly overgrown by various organisms. One of them is completely red by the development of a colony of red sponges. 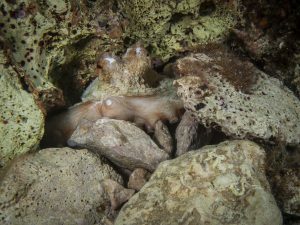 The dive in this place is organised as a drift dive and starts on the southern – protected from the wind and waves – side of the islet, where the plain ranges at the depth of about 6-10 m and where octopuses are commonly seen. 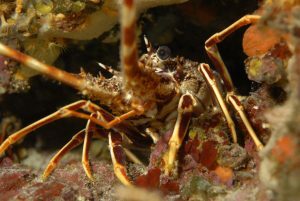 After reaching the outside part of the islet, the diving continues along the wall with numerous pits, in which spiny lobsters, squat lobsters and Mediterranean morays can be seen. 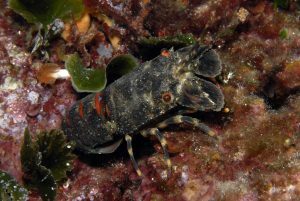 Attentive observers would see many different nocturnal organisms hiding between the rocks. 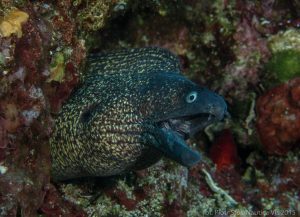 Due to occurrence of these animals, night dives are commonly undertaken in this place. During the day dives it is recommended to focus not only on the benthic organisms. Taking a look at the blue gives a chance of seeing large fish. It takes about 45 minutes to swim around Krava, so after that time diving ends in the place where it started.